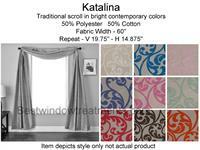 Katalina Curtain Panel (please note, pinch pleated not available at this time, refer to header styles below). 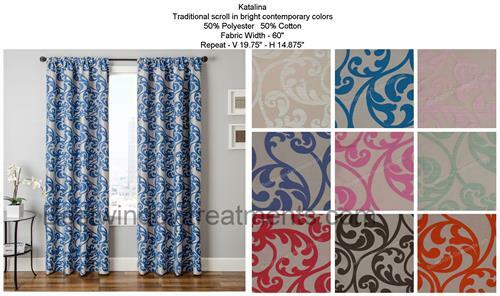 Katalina features a Traditional scroll in bright contemporary colors on a matte jacquard fabric. 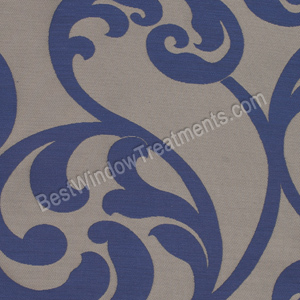 This panel is comprised of two fabric layers with the rear of the panel a reverse design of the front. 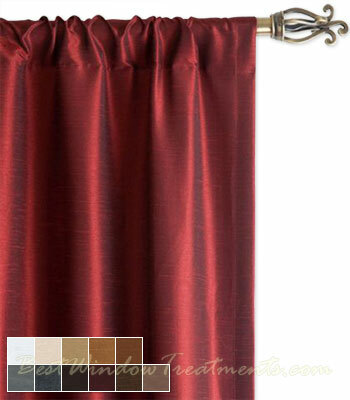 The two layers provide a medium weight and stiffness to this curtain panel. 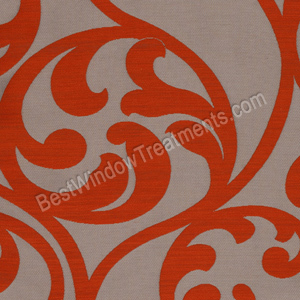 These stunning colors add a new twist to old world European classic window treatments. For added fullness, stiffness or light blocking requirements please see our lining and interlining options below. Sold as a single panel. 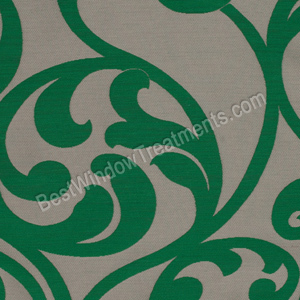 See related products below to order a sample swatch of fabric for your curtains. 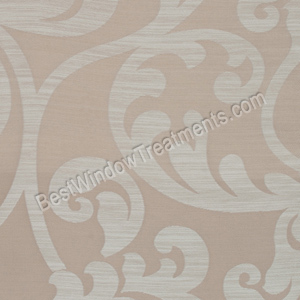 See below for complete information about options for your curtain panel. Colors: Beige, Blue Violet, Canary Yellow, Cardinal Red, Chocolate, Cobalt, Flamingo Pink, Peacock Green, Seafoam, Stone and Tangerine. 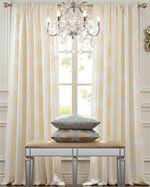 For proper fullness, curtain panels should measure two times the width of the area you are covering. 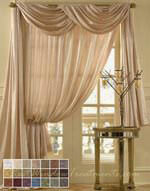 For length, measure from the top of the curtain rod to where you would like the curtains to end. For example, 1" above the floor, slightly touching the floor or puddling on the floor. 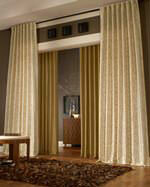 Curtain panels are sewn with a standard 3 inch rod pocket top. 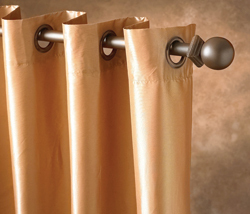 This option allows you to shirr onto a conventional curtain rod or use ring clips to attach to top of curtain panel. Please see example images below. 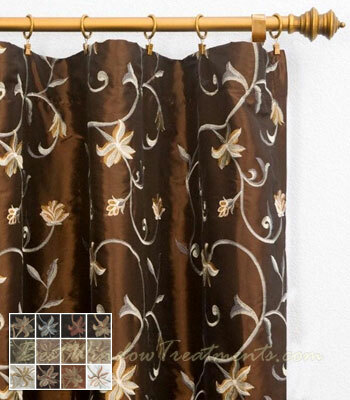 Coordinate as much as possible with your other curtain hardware. Back-tabs provide a faux-pleated look for a more tailored design. 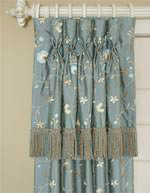 3 inch rod pocket also included to shirr onto curtain rod. 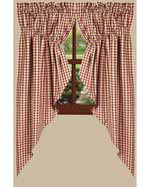 As an alternate header style, you can upgrade to the grommet top for your curtains. 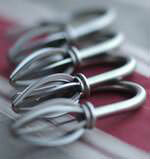 Grommets are metal rings that are sewn into the same area where a rod pocket would be placed. You slide the grommet rings over the curtain rod and the fabric is pushed forward, creating modern, sleek and tailored look for your curtains. This upgrade gives you two options to choose from when installing your curtains. Back-tabs are tabs sewn every few inches along the back side of the rod pocket where they cannot be seen. 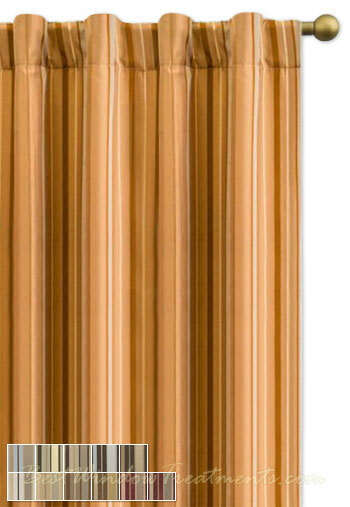 You slide the curtain rod through these tabs. 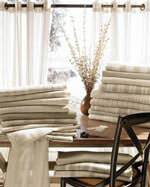 This pushes the fabric slightly forward in-between each tab, creating a tailored, faux-pleated look for your curtains. The traditional rod pocket is also sewn into the top of your panel so you are able to have the alternative installation of the curtain panel shirred directly onto the rod for a more gathered, extra-full appearance. Basic lining can protect your fabric. 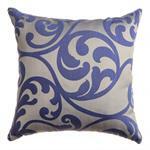 Sun exposure to any material (fabric, floors, furniture) may cause fading over time. 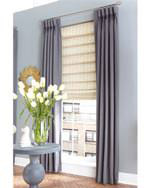 Lining protects your fabric by providing an additional layer between your curtains and the sun. 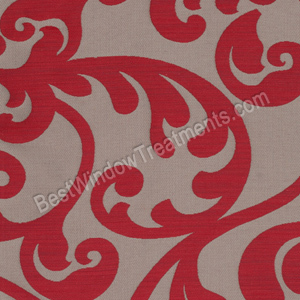 Another important benefit is that it will give your fabric more fullness, helping them drape better around your window. 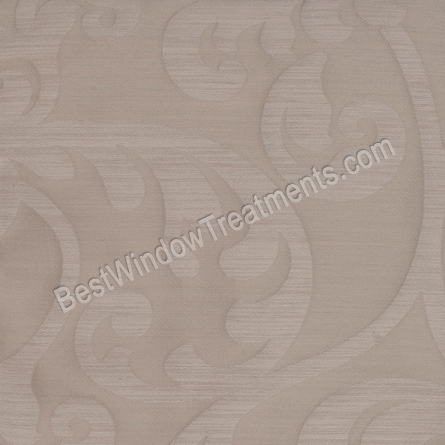 The basic lining is an 80/20 polyester cotton blend in an off-white color and is sewn directly into the panel. An additional lining can be added between the fabric and the basic lining. Interlining takes the same benefits of basic lining to the next level. This double lining further protects your fabric for many years to come. Lining and interlining will provide additional insulation properties from light/heat/cold to help save on energy costs. 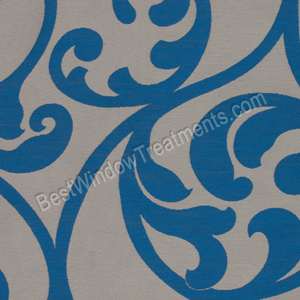 It will also provide extra fullness and light blocking properties to the fabric. 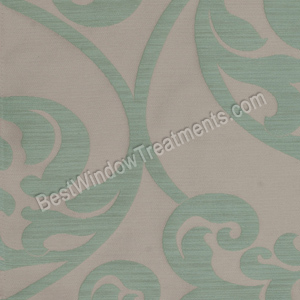 This option also gives a true color to the front of the panel, since not as much light is passing through the fabric. The interlining is 100% white cotton and is sewn directly into the panel. 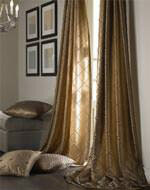 In some cases curtains may achieve blackout properties or near blackout properties, depending on the front fabric. Please note that blackout requirements do limit your fabric choice as not all fabrics can achieve this level of light blocking capability. If you do need blackout properties and are unsure if your desired fabric meets this criteria please contact one of our helpful customer service representatives so we can ensure all your needs are met. 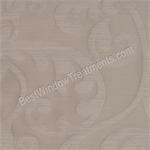 Please call or email us at customerservice@bestwindowtreatments.com. Most panels are sewn in the USA at the time of order. 55'' W x 216'' H (6 yards). See related products below. Shipping Timeline: As most panels are created at the time of order, curtains usually ship within a 14-16 business day timeframe. We will do our very Best to communicate any type of delays to your order. Please take advantage of our sample fabric swatch ordering program to color coordinate the fabrics for your home, as computer monitors widely vary on color display. Ordering swatch samples will also help prevent further delays with exchanges, due to color. While these curtains are not considered a custom order and may be returned, a return authorization code is required, please request via phone or email for a speedy response. 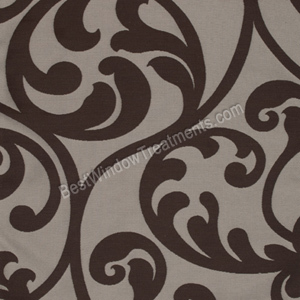 For expedited shipping, please contact us for stock availability at customerservice@bestwindowtreatments.com. Even for rush orders, at least 5 business days is needed for production. 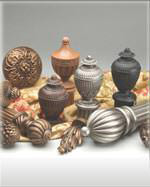 View our customer service information or shop our window treatments.